Fonterutoli Chianti Classico on the wine list at Rustica was a very good sign. I don’t know a thing about Italian wines, but we stumbled upon this vineyard on a long ago visit to Tuscany. Our Lunch at the Osteria Fonterutoli (with plenty of Chianti) is a magical memory that I’m happy to dredge up with a fresh bottle. Concern about the location aside (the former home of Trapiche AND Lupo), Rustica’s transformation into an airy trattoria bodes well. Finding red sauce on the Shoreline isn’t difficult, but there are surprisingly few authentic “Italian” Italian restaurants. No longer. Here’s the real deal, extending to the sweetly theatrical owner. Skip the salads and start with a plate of marinated fresh sardines with broiled potatoes on a bed of arugula. And try as I might to avoid pasta, I couldn’t resist theirs, available by full or half portion, made by hand in house, every day. The tangle of tasty linguini with wild mushrooms, butter, wine and truffle oil was worth every calorie. 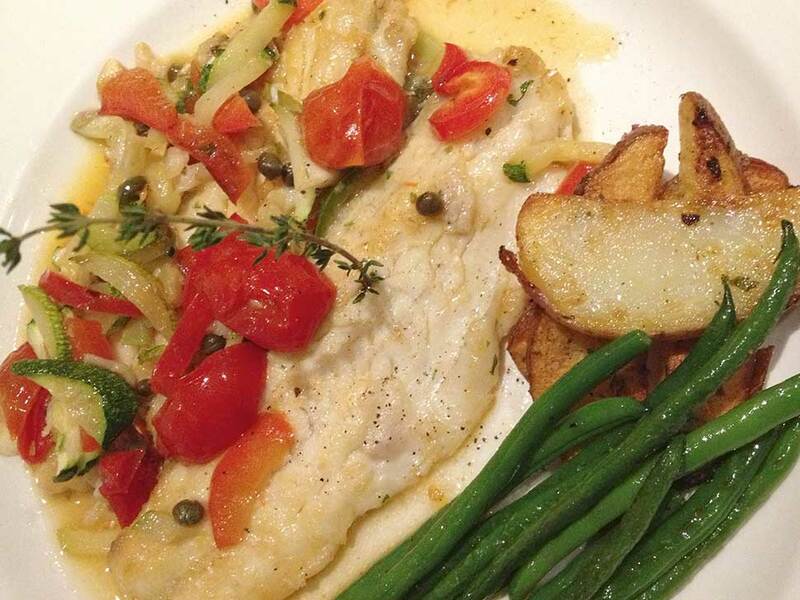 My husband was thrilled with his Branzino; a filet of pan-seared sea bass in a simple lemony white wine sauce. You’ll find the dishes here straightforward, flavorful and crowd-pleasing. The place was packed early on a Wednesday night. No website, but I’ve added a few selections from their menu to my site. See them below and make reservations on Open Table. This is just a sample, there’s much more available on the menu, plus housemade desserts.